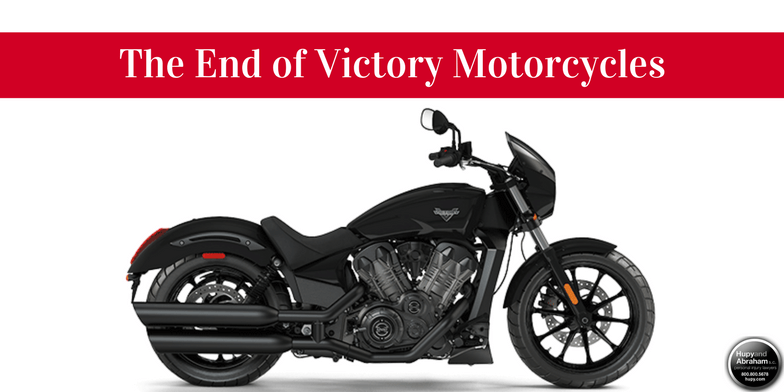 Victory Motorcycles Closes as Polaris Shifts Focus | Hupy and Abraham, S.C.
On January 9, 2017, Polaris Industries announced that after 18 years in the American cruiser industry, they are closing Victory Motorcycles, effective immediately. Citing difficulty competing in the heavyweight market, the brand has produced nearly 60 models over its lifetime, been honored with 25 top industry awards, and even recently experienced an 18 percent increase in sales in the second quarter of 2016. “This was an incredibly difficult decision for me, my team and the Polaris Board of Directors,” said Scott Wine, Polaris chairman and chief executive officer. “Our focus is on profitable growth, and in an environment of finite resources, this move allows us to optimize and align our resources behind both our premium, high-performing Indian Motorcycles brand and our innovative Slingshot brand.”Despite closing, current Victory motorcycle owners don’t need to worry, as the company says it will continue to supply parts for the Victory lineup and honor warranties for the next 10 years. No matter what you ride, we at Hupy and Abraham hope that you have fun while staying safe. Visit www.hupy.com or like us on Facebook for updates on the latest motorcycle news and events, and order your FREE “Watch For Motorcycles” sticker by clicking here.